Last week, the Yummy Bull had the opportunity to attend to a Spain’s Great Match tour stop in Miami. The event took place at the The Moore Building in the Miami Design District. The Great Match is a celebration of the wines and food from Spain. American importers and distributors of Spanish wines presented their finest products, to wine industry professionals, media, and consumers. More than 200 Spanish wines were featured in a walk-around tasting informal format. 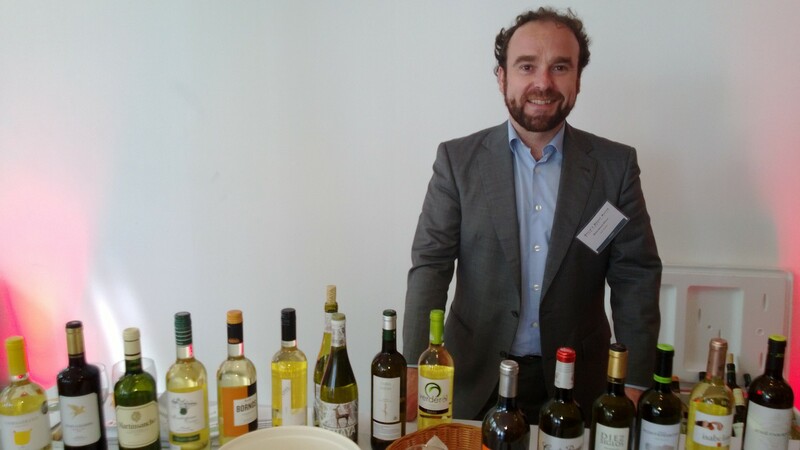 The tasting was complemented with a seminar presented by Grandes Pagos de España, an association of Spanish wine producers dedicated to promote Spain’s estate wines, was held for select trade and media. Attendees tasted through 24 of the 27 prestigious winery estates that belong to Grandes Pagos de España including the finest examples of winemakers, including Carlos Falco, Víctor de la Serna and Mariano García. As Spaniard and wine lover you can imagine I felt in heaven for a few hours… It was difficult for me to find a place to start my particular wine tasting tour, so I decided to begin with Las Rocas from Bodegas San Alejandro. This wine comes for a winery placed in Calatayud one hour driving away from my home town, Zaragoza. Garnacha Borja and Calatayud wine are my day to day wine options at home, so I wanted to test what is new. My favorite was Garnacha 2009, 90 points rated by The wine Advocate. I love garnacha grape because has enough body to fulfill my Spanish taste but It´s fruity and affordable enough to pair with my daily meals. But I made room for Ribera del Duero wines, other of my favorites. I had the opportunity to taste Abadía Retuerta last releases, this winery belongs to Grandes Pagos de España association, and another really good Ribera, Matarromera Crianza 2008. A classic wine with a modern touch. Whites are in my top list of wines too so I was happy to find a representation of Consejo Regulador DO Ruedain the Match. All Verdejos were great and you could find a list who looks for distributor in the US too. I love the bitter spicy touch in mouth of Rueda wine, great for any kind of fish and seafood. Another Spanish white best seller was in Miami last week: Albariño. Every of them where great but I found particularly special the wines from Paco & Lola, a boutique winery from Pontevedra with a really cool and brave branding design too. After 15 sips of wine aprox. I decided It would be a great idea to refuel so I visited Cheese from Spain booth, full of an amazing array of varieties. Cheese and wine are close brothers, you know. Olives were present too. I loved the small cheesecakes made with black olive tapenade on top. Unexpected combination! In Spain we finish our celebrations with Cava, our particular sparkling wine sweet as champaigne, so I wanted to do the same. I could see the release of the new Anna de Codorniu bottles, girlie style! And I tasted Jaume Serra cava rosé, MMM so delicious! Guests also had the opportunity to visit: Tapas: Spanish Design for Food, an exhibition organized by Accion Cultural Española (AC/E) with the collaboration of SPAIN Arts & Culture, La Fundación España-Florida 500 Años and the Centro Cultural Español de Miami, in recognition of the 500th anniversary of the arrival of the first European, Spaniard Ponce de León, to the shores of Florida. This exhibition, who traces a fascinating path of Spanish design related to food will visit Washington DC and many others US cities all around 2014. Posted on November 19, 2013, in Festivals, Products, The yummy chronicles, Wines and tagged albariño, Anna de Codorniu, cava rosé, DO Rueda, grades pagos de España, Matarromera Crianza, match, Spain´s great, Tapas. 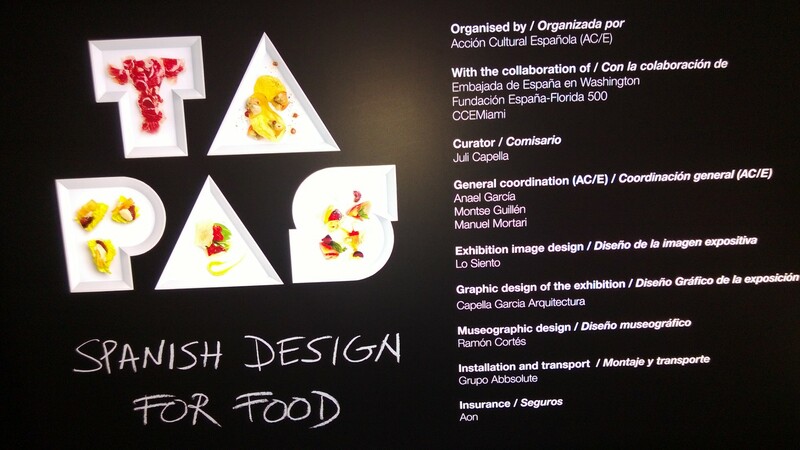 Spanish Design for food, wines from Spain. Bookmark the permalink. Leave a comment.